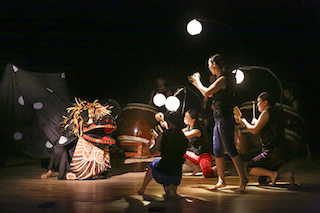 A few months ago I had the privilege of introducing readers to a Japanese drum ensemble whose enduring sounds have performed for over thirty years and today counts 35 talented performers in its troupe. Kodo is credited with popularizing the Japanese drum taiko style around the world--their magic is in the group's ability to draw its audience into traditional Japanese sounds. They spend most of their time during overseas and in Japan, and they recently wrapped up their North American tour, which took them all over the U.S. and Canada. When I followed back up with the group a few weeks ago, they told me how exciting it was to play in America's longest running performing arts theater, the Brooklyn Academy of Music and the thrill of performing to sold-out audiences in cities around the country. 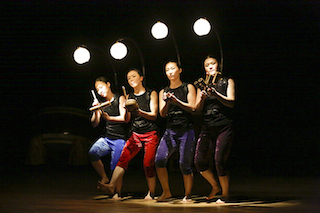 Here's what they had to say about One Earth Tour: Mystery's three-month stint inviting North American audiences to experience the sense of mystery in Japanese folk arts. Steve Mariotti: How did One Earth Tour: Mystery do with North American audiences? Were any changes made in the process? Kodo: Many changes have been made to Kodo's productions ever since we have welcomed in Kabuki actor, Tamasaburo Bando as our artistic director. The theatrical and humorous pieces were internationally acclaimed, and audience of all ages were able to enjoy the performance. We have made a few minor changes to better reflect our North American audience tastes, and it has brought an addition of colorful expression on stage. SM: What were the compositions featured in this tour and what are their significance? Kodo: We had a few newly written pieces for this production which were all influenced by different art forms, culture, and music. Kodo's compositions are written by the performing members, and our production in particular, Mystery, featured many of the traditional Japanese folk arts from all over the country. The serpent scene was Kodo's interpretation of Jamai ("serpent dance") from Iwami Kagura in Shimane Prefecture. There are other traditional Japanese performing arts incorporated into the production such as Shishimai and Namahage. Other pieces in the production were written by the performers who get their influence from touring the world, and spending their time on Sado Island. SM: How did the group shape the timing and delivery for their audience? What did you need to understand about the audience to do that? How do you get to know an audience? 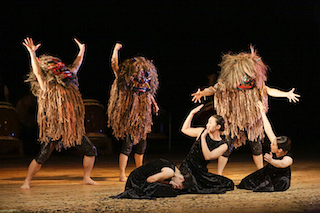 Kodo: As Mystery featured theatrical parts that brought a laugh to the audience, the "ma" was considered an important aspect of the performance. "Ma" is a Japanese expression using a significant length of pause and silence. "Ma" is used to create humor in theatrical scenes, and express tension in concentrated serious scenes. This "Ma" is adjusted at every performance, based on what we learn throughout our audience feedback during tour. The audience reactions are always very genuine; the length and timing of applauses, cheers, laughs, and the standing ovation after the finale, really reflects their feelings during the performance. SM: What are Kodo's near future plans? What is the big vision for the future? Kodo: In May of 2015, Kodo will perform in Osaka Japan in collaboration with Tamasaburo Bando for the musical production called Amaterasu. In August, we will host our 28th annual international music festival called Earth Celebration here on our home soil on Sado Island. In October, we will be in Montreal, Canada to be part of a contemporary ballet production called Kaguyahime. After our performances of the production, Mystery, we will have our next new production called Eternity, touring domestically in Japan. At the end of 2015, the newest production called Chaos will premier. With the artistic direction of Tamasaburo Bando, Kodo will continuously aim for the highest quality performance, and present the audience with everlasting excitement of taiko music. Kodo will be back on U.S. soil in 2017, and you can see them in Europe next year.